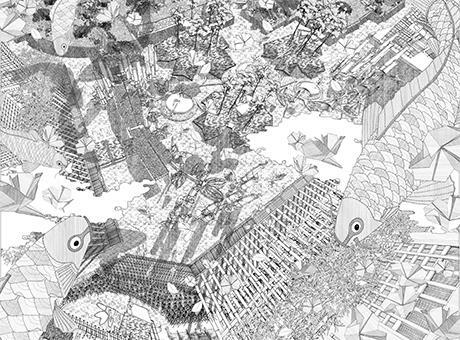 An exhibition of architectural drawings by three award-winning recent graduates from The Bartlett School of Architecture’s MArch Architecture Unit 10, Ned Scott, Nick Elias and Anja Kempa. ‘Urban Tales’ explores the fictitious transformation of urban spaces in London, Slough and Tokyo. It draws on the cultural social and political potential of contemporary cities in captivating threads of imagery, to question the role of architecture in a changing world and use fictional narratives to design fantastical, but possible, cities.